The Wonderful Wizard of Oz children’s novel written by Frank L. Baum spawned one of the greatest childhood movies of all time with Judy Garland taking on the role of Dorothy in the 1939 blockbuster. This is now the third slot based on the classic to be released by WMS after the original Wizard of Oz slot machine and the Wizard of Oz Ruby Slippers slot machine but Wicked Riches has a more traditional style than its predecessors so how will it stack up against those that have come before it? With the dark and creepy appearance, a long and winding road takes you to the Witches Castle which is visible in the distance against the moon to set the scene for big spooks and bigger wins. 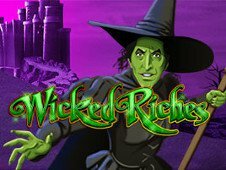 Played across 5 reels and 30 paylines, Wizard of Oz Wicked Riches boasts a 96.01% RTP, a generous free spins mode, random Winged Monkey feature, and Tornado feature which could see you ride away on the broomstick with one of four jackpots! WMS have designed the symbols in Wizard of Oz Wicked Riches in a dark and dingy manner to fit in with the Wicked Witch theme, and there is a total of eleven symbols to watch out for to make winning combinations on the reels and reap in the ‘wicked’ wins! There are three special symbols including the Wild which is the Wizard of Oz logo and this substitute for all standard symbols, a Jackpot symbol, plus a Scatter (Wicked Riches Bonus) that pays 100x your stake for five on a payline or 10x your stake for four on a payline while triggering the free spins feature as a minimum of three are required. The standard value symbols include the Wicked Witch along with her Castle, Scarecrow, Tin Man, Cowardly Lion, the Witches Hat, an Owl, Hourglass, and a bucket of Water which has the lowest value of all – but is a nice change from the playing card symbols so often used by slots developers! This feature will be familiar to those of you who have spun the reels of the two Wizard of Oz slot machines released prior to Wicked Riches, as it begins once the Winged Monkey leaps onto the central reel. This then sees one of the symbols transform into a Wild and subsequently all other symbols of the same kind that are viewable on the reels are then turned Wild – with the reels then recalculated to count up all of your winnings thanks to the new combinations that are made. In most cases it’s small wins you earn but the wins can truly rocket when numerous symbols of the same kind are turned Wild! As with most free spins features, it’s the Scatter symbol (Wicked Riches Bonus symbol) you’ll require with three of them having to be present on the reels for it to begin. An animation then plays out taking you deep into the dark and creepy castle to play out your spins. Sadly, it’s not as rewarding as the free spins mode in IGT’s Siberian Storm slot machine free spins feature where you can earn 96 initial free spins, but it’s still pretty rewarding. You are given an initial 8 free spins and while there are no multipliers attached to them a winning combination sees the Wicked Witch make an appearance and grant you a random multiplier to further boost the win. On top of this you can retrigger the feature for additional free spins, but overall it’s not too exciting! The Tornado feature is yet another that is triggered at random without the need of combinations of symbols on the reels – and it does actually trigger quite regularly. You then get to make a selection from eight barns with a cash reward hiding behind each one or access to the feature where one of four jackpots await. The higher your stake the higher your chances here are the number of feature symbols hidden in barns depends on the total bet amount with 1 in 8 for 30p, 2 in 8 for 60p, 3 in 8 for 90p, 4 in 8 for 1.20, and the max stake of 2.40 automatically rewarding you access to the feature. Here the jackpot values are 10 for Kansas, 25 for Munchkinland, 200 for Haunted Forest, and 2,000 for Emerald City! Unfortunately, despite the low betting options available of 30p, 60p, 90p, £1.20, and £2.40, Wicked Riches is the worst of the three Wizard of Oz slots released by WMS. While the jackpot isn’t a progressive like Microgaming’s Mega Moolah slot machine, the Emerald City jackpot will give your balance a boost but that’s all you’ll be getting excited about!